Developers often use cutscenes to tell parts of a game’s story and engage the player. Some games use specially pre-rendered animated scenes with higher detail models, while others use the actual in-game models. Using in-game models can be a great cost and time saver to you because you don’t need to make new models, rigs and animations just for cutscene story moments. And just because you’re repurposing your existing assets doesn’t mean that you need to skip the special effects or drama! Unity has a rich tool to help you make engaging cutscenes — the Unity Timeline! In this tutorial, you’ll learn about Timeline and how to make cutscenes with animations and camera changes. Download the starter and final projects using the “Download Materials” link at the top or bottom of this tutorial. What Exactly Is a Timeline? You will accomplish this tutorial using Unity Timeline — but what is a timeline? A timeline is a literal GameObject with a timeline component, which is editable in the Unity Timeline window that controls the animation keyframes and object life cycles. When you are making a cutscene with Unity Timeline, you are setting all the animation keys you will use, as well as determining when they need to fire. For this tutorial, you will also use AnimationController, which can be thought of as a super-set of animation keyframes. Whenever a character performs an animation, such as walking, every single vertex on the object that moves needs to have it’s path mapped out. You won’t be worrying about creating model and rig animations in this tutorial — it’s already done for you. But it’s helpful to know that, whether you are manually setting an animation keyframe or using an AnimationController animation, they are all basically the same thing: The position of objects at a given moment in time. A timeline is the conductor that coordinates all of these movements to create a scene. This will all make sense as you dive into using Unity Timeline. Timeline Asset: This is a track that is linked to a GameObject that exists in the hierarchy. It will store keyframes associated with that GameObject in order to perform animations or determine whether the GameObject is active. Associated GameObject: This is the GameObject that the track is linked to. Frame: This is the current frame in the timeline that has been set. When you want to change animations, you will set the keyframes at the starting and ending frames. Track Group: As scenes grow, so will the number of tracks. By grouping tracks, you can keep your tracks organized. Record Button: When this is active, you can change the current frame and set the position and/or rotation of the GameObject in the scene, and it will record the changes. Curves Icon: Clicking this will open the Curves view to give you the finer details on the associated animation keyframes so that you can adjust them as needed. Don’t worry if that felt like a lot to take in at once — you’ll revisit the above during the tutorial. The most important thing to know, at this stage, is where the Timeline window is and that, by selecting the Timeline GameObject, you can access the Timeline window. This is the default animation set in the Animation controller. This tutorial will leverage animations that have already been set up for you, and you won’t need to worry about the inner workings of models, animations or controllers. But if you want to learn about that process you can take a look at our Introduction to Unity Animation tutorial. 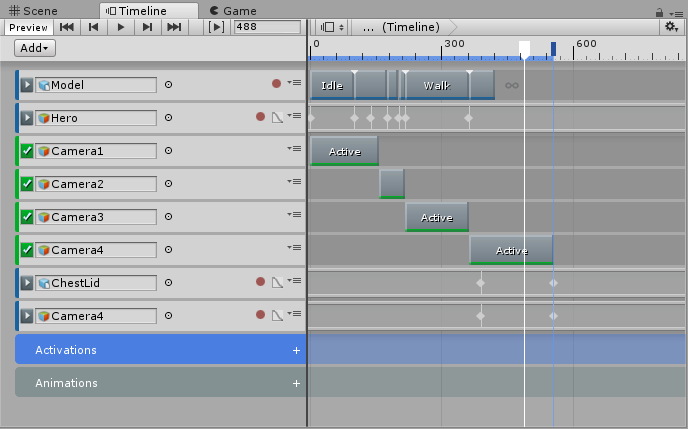 You’ve now created the Timeline GameObject that will coordinate all the animations and camera changes for the cutscene. Under the hood, Unity has saved an Asset file called Timeline.playable to disk. 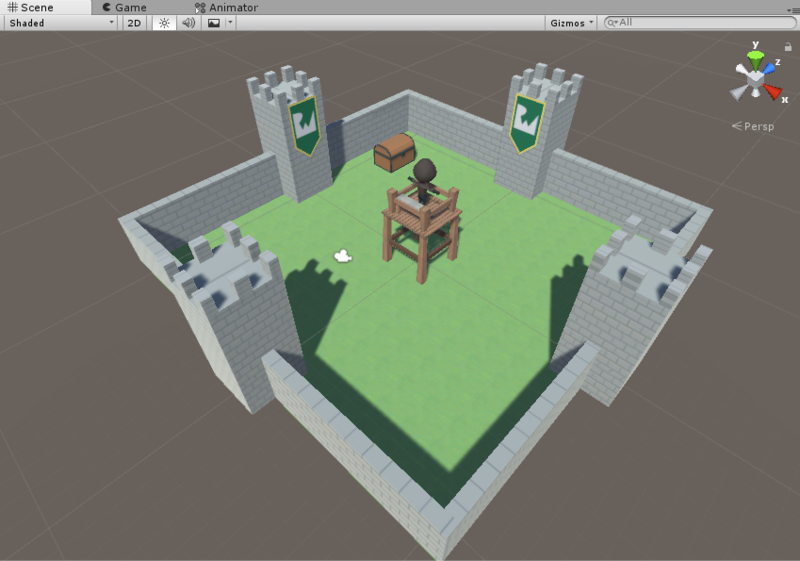 On the Timeline GameObject, Unity added the Playable Director and Animator components. The Playable Director component contains the Playable field that is bound to the Timeline asset that you’ve just saved. 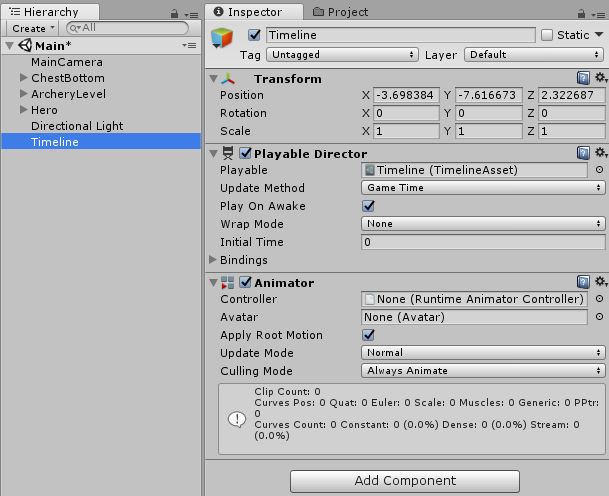 The Animator component that Unity added would, in theory, allow you to animate the Timeline GameObject, but you won’t be doing that, so you can just ignore this. Note: The reason you added both the Hero and Model GameObjects has to do with making sure animations will properly zero to local space. The Hero GameObject is a container for the Model GameObject, which allows the animations to play without interfering with the position from where they are playing. Whenever you need to move the hero, you will be animating the Hero GameObject. When the hero needs to animate — which it can do while moving, too — you will use the Model GameObject. Without this parent-child relationship, the animations that the Model will play would incorrectly override the Hero GameObject movement settings if you didn’t properly set it as a child. Since the Hero GameObject track represents the position of the hero, you need to set it’s position as a starting keyframe. Select the Hero track in the Timeline window and click the Record button (red circle) to begin recording. Select the Hero GameObject in the Hierarchy window and set the X Position to -1, then immediately set the X Position back to 0. In this project, the hero was already in the position where he needed to begin. However, until you actually change the unit position, it won’t register as a keyframe while recording. So if you ever need to set a keyframe while recording for a position where the keyframe already is, just move it and move it back to register it. An easy way to do this is to set the X Position of the object to -1 of its current position, then set it back. You will use this trick a few times in this tutorial. 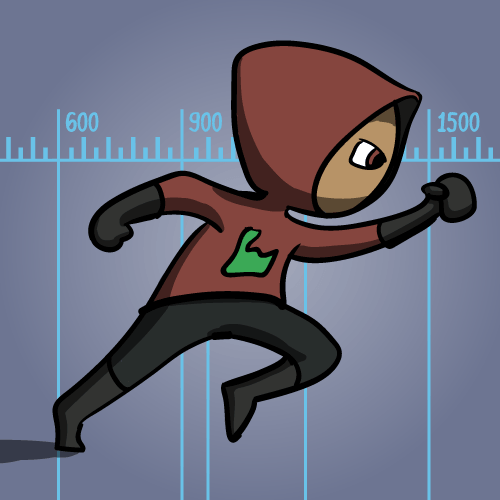 Next, you will have the hero idle for 100 frames before he jumps off of the tower. Currently, you have only set the starting position of the hero, but you need to set the hero to the same position (i.e. the top of the tower) 100 frames later — otherwise, Unity will start interpolating a movement animation immediately. Just as before, select the Timeline GameObject — this time, however, you should click the frame box at the top and type in 100. This sets the keyframe to frame 100. Click the Record button on the Hero track. Select the Hero GameObject and, under Transform in the Inspector, set the X Position to -1, then immediately back to 0. Click the Record button once again to stop recording. Now you have setup the Hero starting keyframe and are in a good place to continue on with animations. First up, you’ll need to set your position data. Next, you’ll animate the hero to jump off of the tower, but you first need to move him up and over the railing, then down towards the ground. To do so, first select the Timeline window and then set the frame to 138. Click the Record button on the Hero track. Now, select the Hero GameObject. Under Transform in the Inspector, set the Y Position to 3.934 and the Z Position to 1.97. Save the scene and press Play to see your work! You’ve set the position data but not the animations to go with them. You’ll sort that out next. With the Timeline window selected, right-click (Command-click on a Mac) the Model track and click Add From Animation Clip, then select Jump. This should add a Jump animation right next to the Idle animation. Save the scene, press Play and behold your work! It’s a little hard to follow the action after the hero makes the jump off of the tower, so now would be a good time to start working with cameras. Tip: You can set the current frame marker using the frame counter field in the Timeline Inspector. If you set the marker to the frame you want to drag a track to, the track will snap to the frame marker. You will now add another camera — only you will position this camera overhead so that it can get a bird’s-eye view of the hero after he’s jumped over the tower railing. In the Hierarchy window, select Camera1, and duplicate it by pressing Control-D (Command-D on a Mac). Rename the duplicate to Camera2 and set it to be disabled. As with Camera1, select the Timeline window and drag Camera2 from the Hierarchy onto it; again, this will prompt you to choose a track so select the Activation Track. Now, slide the Active bar so that it begins right after the end of the Camera1 activation (frame 158). Drag the right side of the Active track for Camera2 so that it ends at frame 216. Save the scene, press Play and watch as your scene now has a camera cut! Now that your hero has landed on the ground, he should turn towards the treasure chest and start walking. Select the Timeline GameObject and set the frame to 202. Click the Record button on the Hero Track to begin recording. Select the Hero GameObject and beneath Transform in the Inspector, set the Y Rotation to -1, then immediately back to 0 to set a starting keyframe for the Hero GameObject’s rotation. With that complete, again select the Timeline GameObject and set the frame to 216. Again select the Hero GameObject and, beneath Transform in the Inspector, set the Y Rotation to -90. Note: Setting position and rotation keyframes occur independently of each other. Earlier, when you set the starting hero position, it never saved a keyframe for rotation, which is why you needed to set a new one here before setting the desired rotation to face the treasure. Now the the hero has landed safely and is looking at the treasure. It’s time to head over and open it! Tip: Your Timeline track is starting to get big, so if you need to zoom in or out you can scroll the mouse wheel up and down to zoom in and out, respectively. To pan left and right, click and hold the middle mouse button and slide your mouse left and right. Select the Timeline GameObject and set the frame to 216. Click the Record button on the Hero track to begin recording. Select the Hero GameObject and beneath Transform in the Inspector, set the X Position to -1 then back to 0 to set its starting position keyframe. Then, on the Timeline, set the Hero track to frame 361. Return to the Hero GameObject and, beneath Transform in the Inspector, set the X Position to -6. Return to the Hero Track and end recording. You might notice that it looks as though the hero has walked past the treasure, but this seems to be an issue with the Timeline preview because, as you will see shortly, the hero will walk right up to the treasure and stop. Rather than just have the hero walk with Camera2 hogging all the action, you can now use Camera3 to do a behind-the-hero shot. 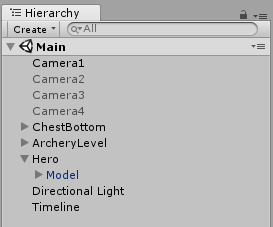 To do this, beneath the Main menu in the Hierarchy window, select and drag Camera3 over the Model GameObject, which is beneath the Hero GameObject, to set it as a child. With Camera3 childed to the GameObject Model, it will now follow along all the GameObject Model’s movement from behind. However, Camera3 still needs an activation track so that it is active at the right time. Almost there! Now, the hero just needs to open the treasure by… kicking it, of course! For the final shot, you will use Camera4, setting it up as you did Camera1 and Camera2. The treasure chest needs to open, so you’ll now add the animation for the lid of the chest. Setting this animation follows similar steps as the previous ones. Expand the ChestBottom GameObject in the Hierarchy window. Drag the ChestLid GameObject onto the Timeline and select Animation Track. In the Timeline, set the frame to 389. Now, select the ChestLid track. Click the Record button. Now that you’re recording, select the ChestLid GameObject in the Hierarchy window and set its X Position to -1, then back to 0 to set its initial position. In the Timeline window, set the frame to 555. Finally, beneath Transform in the Inspector, set the ChestLid Y Position to 6. Press the Record button again on the track to stop recording. This will animate the chest’s lid to fly through the wall. Now, it’s time to position Camera4 so that it’s over the chest when the lid flies up. Again, you’ll follow the same steps as the previous camera, so see if you can do it without every step laid out. Set the Position of Camera4 to (X:-9.00, Y:5.4, Z:5.18). Set Camera4’s Rotation to (X:90, Y:0, Z:0). As with the other added cameras, adding an animation will make the scene more exciting, and it will look good to zoom in as the chest is opened. Select the Timeline window. Drag the Camera4 GameObject onto it and create an Animation Track. Set the track to frame 389. Click the Camera4 track and then click the Record button. Select the Camera4 GameObject. 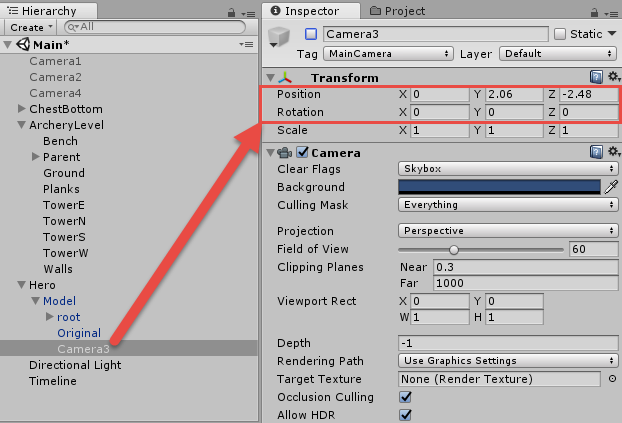 Beneath Transform in the Inspector, set the X Position to 0, then back to -9. 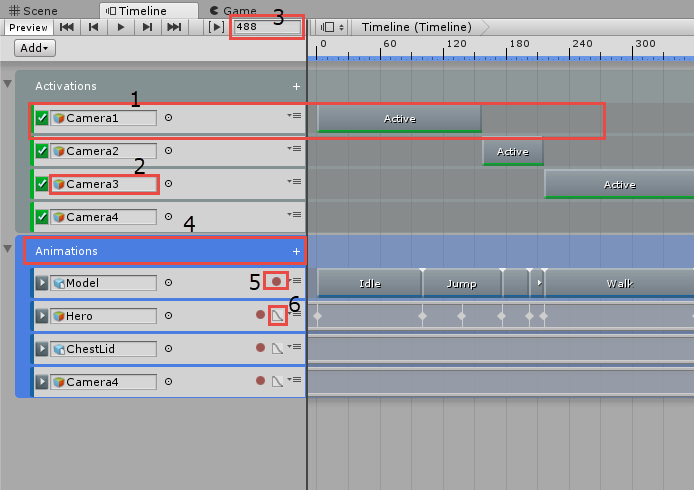 In the Timeline window, drag the Animation Track to frame 555. The full scene is now done. Press Play and have a look! This was a short animation with only a few actors, so it’s pretty easy to keep track of the GameObjects and various Tracks. But creating a more complex scene with many moving parts and actors can become very difficult to manage. This is why organization is absolutely critical. While your scene may look done (and it is, great job! ), it’s a good idea to take a few minutes and organize it — your future self will always thank you for this. Remember to save your work. Lean back in that director’s chair and give yourself a pat on the back! You have completed your first Timeline. If you skipped through some parts of this tutorial, don’t forget you can download both the starter and final projects using the “Download Materials” link at the top or bottom of this tutorial. You’ve done great work and created a cutscene using model animation, camera changes and object lifecycle updates — yet there is still so much more to explore. One of the biggest things related to Timelines is custom scripting, wherein you tie in special animations with code that you want to execute along with it. You can learn more about custom scripts here. If you’re feeling bold, why not try adding a custom script to this scene after the treasure is opened? If you are interested in learning more about Unity animations in general, be sure to check out this great Introduction to Unity Animation. To learn more about creating 3D models and the Animation window, check out this massive series by Unity here. Last but not least, if you are interested in making games, you should consider getting our Unity Games By Tutorial book. It covers how to make four types of games from scratch and walks you through every step of the process. Be sure to post any questions you have below and feel free to join us in the forums.